According to statistics from UN Comtrade, China was the second biggest export country of wheat gluten(HS110900) in 2015 sorting by export volume, after Belgium. China exported to 67 countries and regions in 2015, at total amount of 148.95 million kilograms, and 203.2 million U.S. dollars. According to statistics from UN Comtrade, Chinese wheat gluten mainly export to Northern Europe, America, Southeast Asia, and Northern Africa. 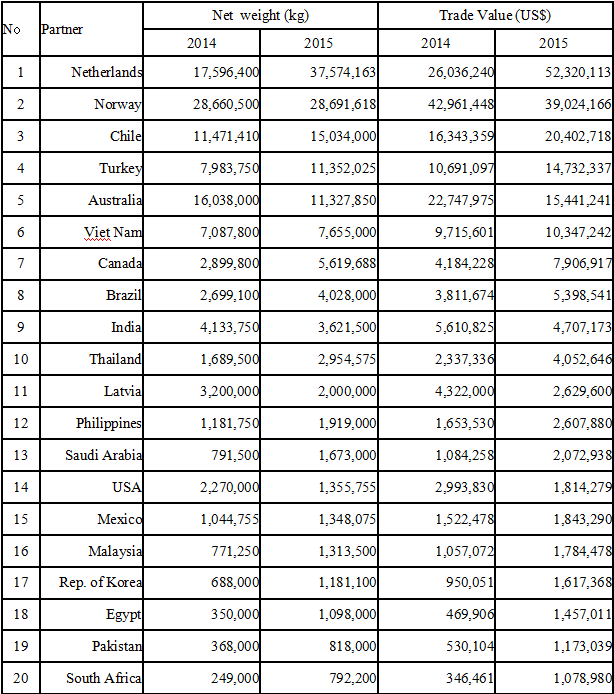 The top 10 importers’ volume all increased in 2015, except for Australia and India. Egypt, Pakistan, South Africa newly ranked top 20 in 2015. Owing to the bottom of Chinese vital wheat gluten price in 2013 and 2014, numerous amount of importers chose to ship out in 2015. 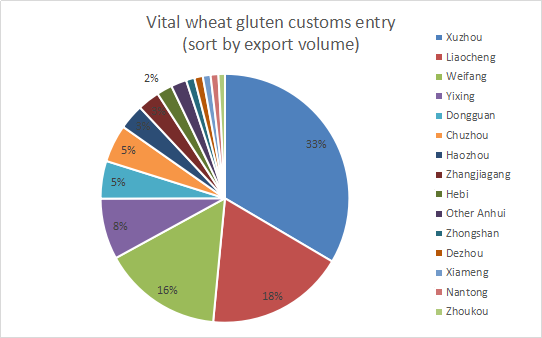 In this situation, a majority of contries, listed above, incresed the import volume of wheat gluten from China in 2015, including Netherlands, Norway, Chile, Turkey, ect. The import volume of Netherlands had incresed from 17.6 thousand tonnes in 2014 to 37.6 thousand tonnes in 2015, ranking first. 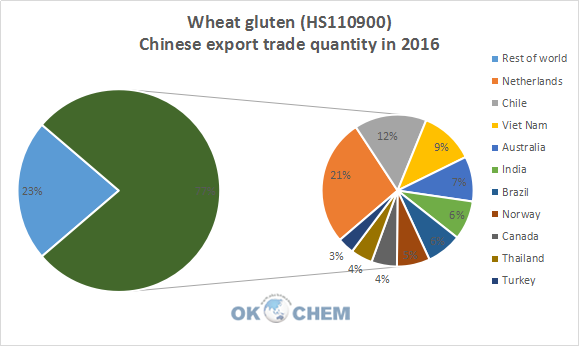 According to statistics from Globalwits (2016), China exported majority amount of wheat gluten(HS110900) to Netherlands, Chile, Viet Nam, Australia, India, Brazil, Norway, ect, in 2016. Netherlands still ranks first in 2016, importing 26.6 thousand tonnes from China. Norway’s wheat gluten import volume from China in 2016 was just 24.2% of 2015, ranking 7th in 2016. Statistics from UN Comtrade and China Customs showed that the export markets are quite identical with small differences in export volume because of different statistical approaches. 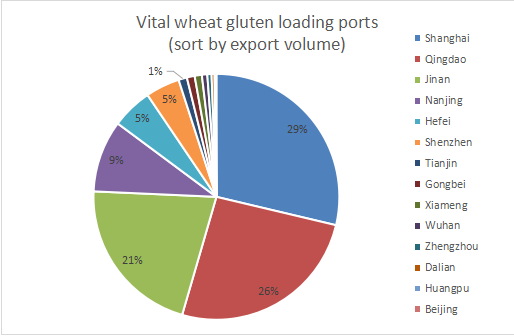 The top wheat gluten loading ports (sort by export volume) are Shanghai, Qingdao, Jinan, Nanjing, Hefei, Shenzhen, Tianjin, Gongbei, Xiameng, Wuhan, Zhengzhou, Dalian, Huangpu, Beijing. Ports of customs entry (sort by export volume) are Xuzhou, Liaocheng, Weifang, Yixing, Dongguan, Chuzhou, Haozhou, Zhangjiagang, Hebi, Other Anhui, Zhongshan, Dezhou, Xiameng, Nantong, Zhoukou and so on. 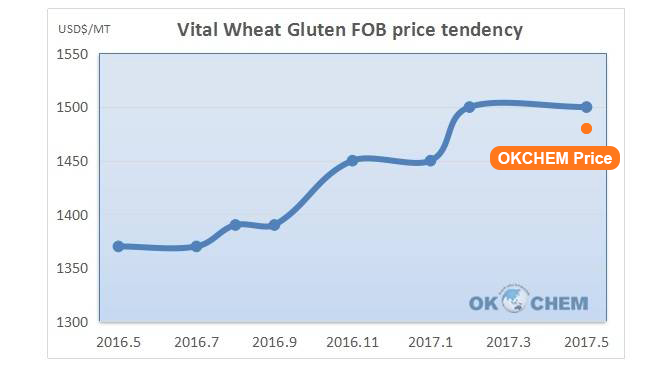 The Chinese FOB price of vital wheat gluten has kept rising since October last year because of environment protection policy. 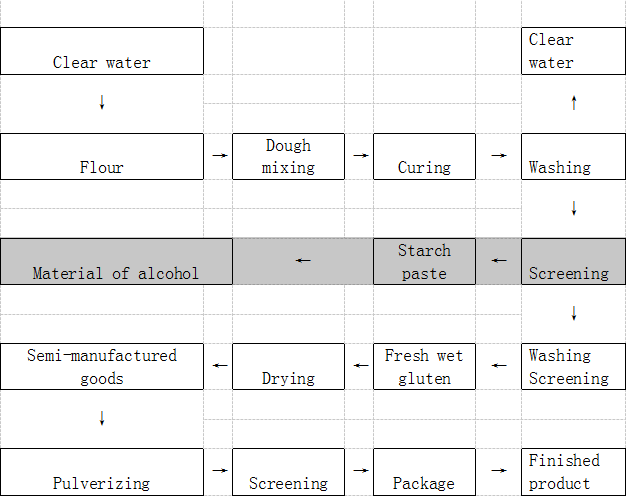 Many small and middle size manufacturers of wheat gluten located in Henan province and Anhui province were forced to shut down for non compliance with environment requirement. China's environment protection policy also leads to a sharp increase in domestic demand of vital wheat gluten, and then the ongoing higher price. It is indicated that the FOB price will remain high recently because the manufacturers intend to satisfy domestic market for higher price.